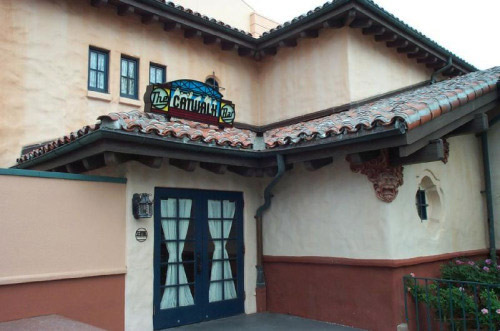 Those of you who visited the Disney-MGM Studios in the early years may remember a restaurant in what is now the Animation Academy area. 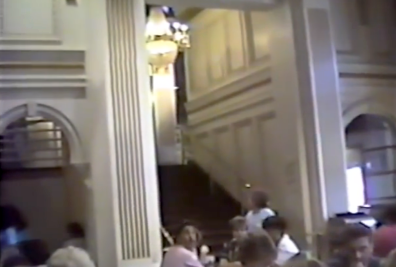 That restaurant was called the Soundstage Restaurant and the inside was designed from the actual movie sets of the Plaza Hotel scene that had been used in the movie “Big Business” starring Bette Midler and Lily Tomlin from 1988. The Soundstage Restaurant was located in Soundstage 5 where Playhouse Disney is located and was a full-service restaurant that was designed to give the effect of a "live set". 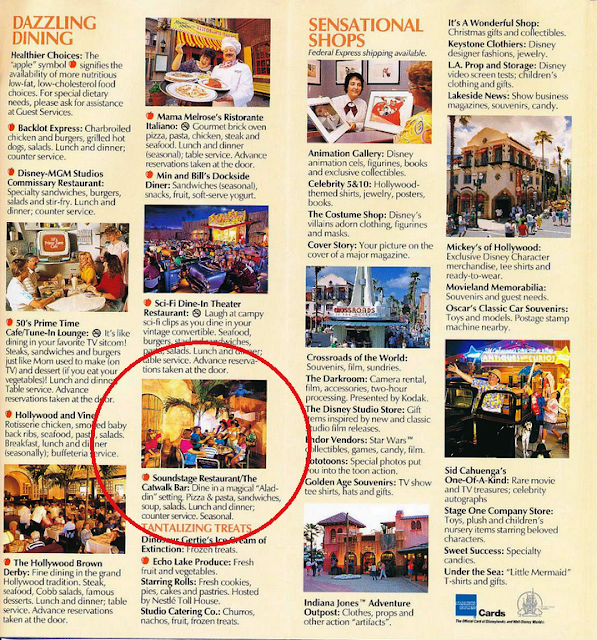 A 1993 Disney-MGM Studios park map featuring the Soundstage Restaurant. The Catwalk Bar is circled in red. 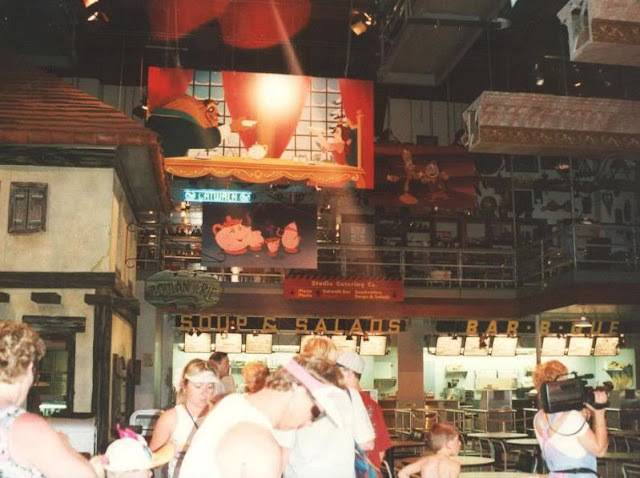 The Soundstage Restaurant was a buffet that featured characters from Disney animated classics and served breakfast and lunch. 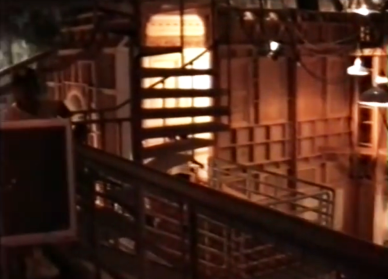 The "live set" theme featured set pieces and props from other productions strategically lying about. There were sandbags on ropes and lighting control boards and that sort of thing hanging around. 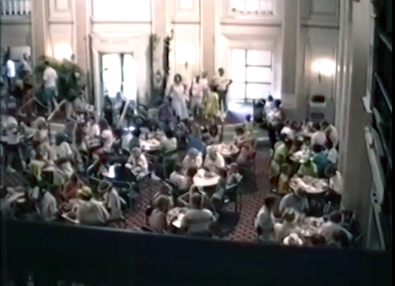 The cast members that worked at the restaurant wore catering costumes to tie-into the whole theme of the restaurant being a "wrap party". The Catwalk Bar can be seen above. The real gem of the restaurant was the fantastic Catwalk Bar. 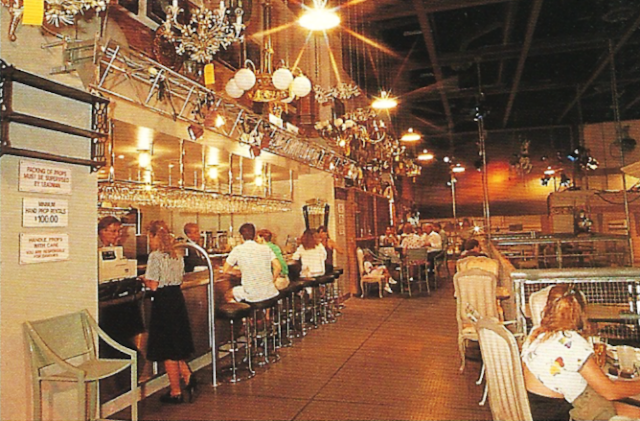 The bar was a cocktail bar located on the catwalks above the seating and service areas of the Soundstage Restaurant. The bar served appetizers, light snacks and even featured sporting events on a large television. 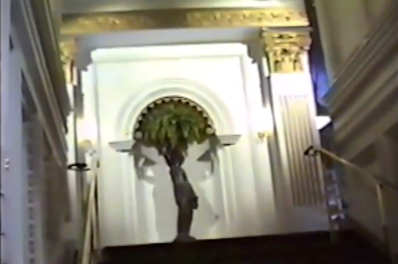 The photos contained in this article are the only few I have ever seen and are pretty rare as not that many people took photographs of this location. (If you have one that you may have snapped back then please let me know.) As you can see in the picture above, the Catwalk Bar was, in fact, pretty dark and it was up high looking down into the main dining area. 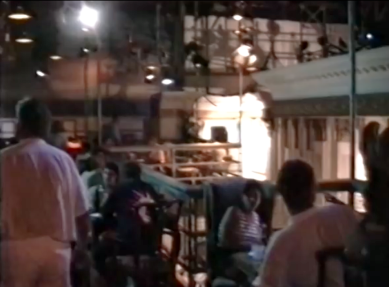 View of the Soundstage Restaurant from the Catwalk Bar. 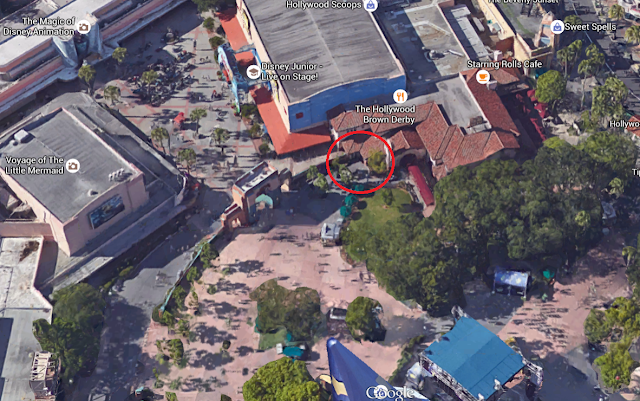 Aerial shot of the park with the entrance location circled in red. Catwalk Bar sign and entrance. 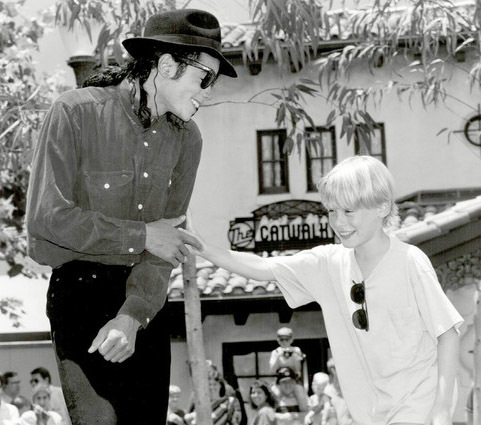 Michael Jackson and Macaulay Culkin during a visit to Disney-MGM Studios in 1992. In the background you can see the sign and entrance to the Catwalk Bar. 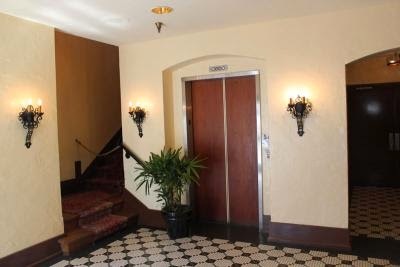 Elevator and stairway entrance near Brown Derby bathrooms. 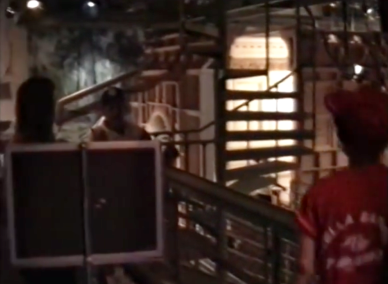 Notice the chain blocking the stairs currently. 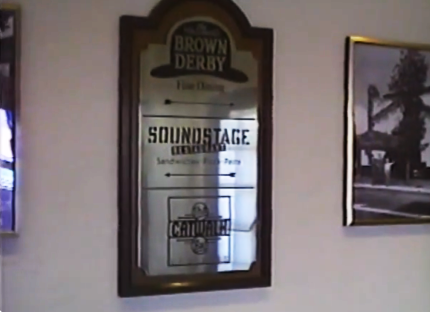 On the wall directly in front of you was a silver plaque locating the entrance to The Catwalk Bar as well as directing you to either The Brown Derby or Soundstage Restaurant. 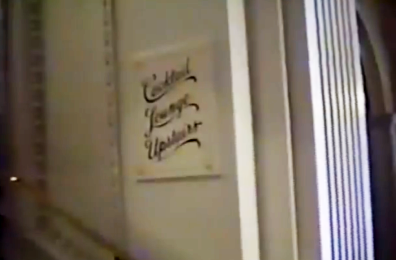 At the entrance to the staircase to get up to the Catwalk Bar a plaque reading “Cocktail Lounge Upstairs” can be seen. Staircase up to Catwalk Bar. On November 14, 1998, the Soundstage Restaurant closed for good to make room for a new show called Bear and the Big Blue House. 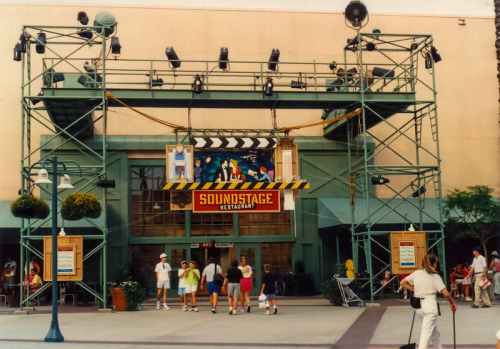 After Bear in the Big Blue House took the location of the Soundstage Restaurant, the Catwalk Bar remained open ONLY after the final daily performance of the stage show was complete. 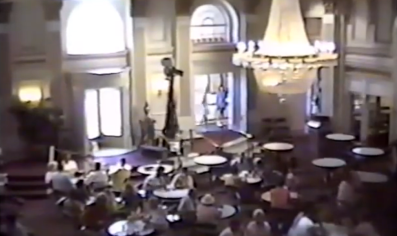 By this time, the entrance from the former Soundstage Restaurant was taken out and the only remaining way up to the bar area was thru The Brown Derby entrance. Due to this inconvenience, the Catwalk Bar eventually closed for good shortly thereafter. Although both the Soundstage Restaurant and the Catwalk Bar have been removed while Disney Junior - Live on Stage! 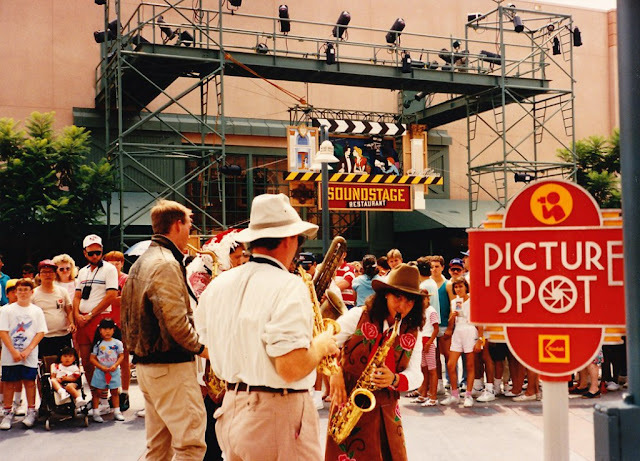 took its place, it will always remain a legendary and cherished piece of Disney-MGM Studios history. Oh, wow! 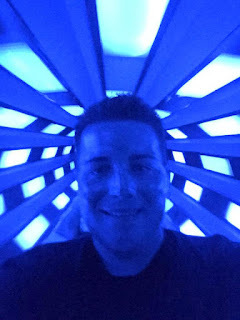 I stumbled on this as I was looking for info about this little gem at Disney. I've had many drinks there. I remember you would pass Aladdin's Lamp if you took the stairs. Great drinks. Sorry it is gone. 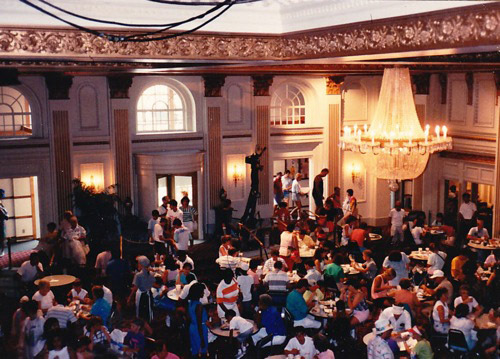 I always thought of the Catwalk Bar as Disney's best kept secret. Relaxing on couches and armchairs while munching on a snack of pumpernickel pieces, cheese, and grapes.....in the peace and quiet....away from the bustle.....a secret hideaway for the weary bodies doing 16 hour days with 2 kids. When I was there in 1999/2000 new years there was a 60s dance studio below the catwalk bar. Didn't know that there was a restaurant at one time. Was hoping to find it again but everything changes so fast at Disney.